You are currently browsing the tag archive for the ‘JAXA’ tag. OK, we have a lot to get through this week. We have a new president coming along, and even though this charlatan may well usher in the end times, he is certainly known for grabbing ratings (among other things). Also, last week, I promised to write about why I am having trouble with ‘Romance of three Kingdoms.” It is a book about deceit, trickery, and cruelty as the tools of leadership. Perhaps now is a good time to talk about its dark lessons. However before we get to any of that, today let’s take a quick trip off-world to our sister planet Venus (a planet which endlessly fascinates me) where some exceedingly strange developments have been in the works. Venus is currently being monitored and observed by the Japanese Space Agency probe Akatsuki. On December 7th, 2015, the probe spotted a huge crescent wave 6,000 miles long in the atmosphere of Venus. The probe lost sight of the massive bow shaped phenomena as it moved through its orbit, and, when it returned to position a few days later, the wave was gone. So what produces a 6,000 mile long super cloud on a planet already known for extreme fast moving clouds of sulfuric acid. Scientists theorize that this was a gravity wave. Gravity waves are not too be mistaken for the gravitational waves of deep space (which are caused by distortion of spacetime from supermassive objects). Instead a gravity wave is a wave propagated within a fluid (like air or liquid) through the effects of gravity. When water flows over a sandbar, gravity restores equilibrium on the other side–which causes a wave effect. This is a familiar pattern in all sorts of fluid dynamics–including clouds passing over mountains. It is believed that the giant crescent wave within the atmosphere of Venus originated from the atmosphere flowing over vast mountain ranges on the surface. Even if this is not as unfamiliar a phenomena as it might deem when first hearing the name and looking at the pictures, it is very beautiful and it is appearing on a scale hitherto unknown in terrestrial parts (although the supermassive planets have their own bizarre cloud structures which put it to shame. for now lets just enjoy looking at the huge bow shaped cloud on the closest planet to Earth. Thanks JAXA for making this discovery! What will the strange hot caustic atmosphere of Venus do next? The final mission of the Space Shuttle Discovery is currently underway. Additionally, the X-37B, the “secret” robot space shuttle operated by United States Air Force, just concluded a successful seven month mission last December. 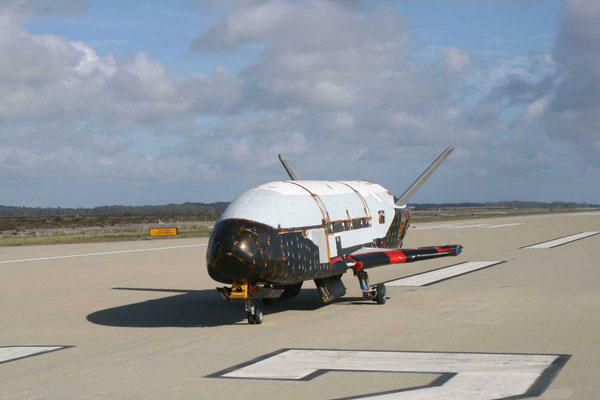 The Air Force is primed to launch a second X-37B robot shuttle at 3:39 p.m. (EST) today. This flurry of activity leads to general reflection concerning spaceplanes, crafts designed to operate in outer space, fly back through earth’s atmosphere, and land on ground. With two in orbit at the same time spaceplanes are now more in use then ever…while simultaneously fading away. It’s certainly earned its retirement. Discovery has flown more missions than any other shuttle – more than any other spacecraft, in fact. 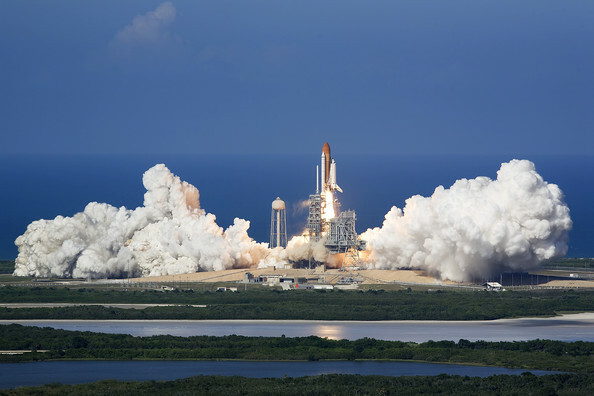 After 38 missions to date, and more than 5,600 trips around the Earth, Discovery has carried satellites such as the Hubble Space Telescope into orbit and sent the Ulysses robotic probe on its way to the Sun. It was the first shuttle to rendezvous with the Russian Mir Space Station, and it delivered the Japanese Kibo laboratory to the International Space Station. The objective of the current mission is to deliver spare parts and supplies to the International Space Station. Along with water, new personnel, sundry modules, and widgets, Discovery is also delivering Robonaut 2. 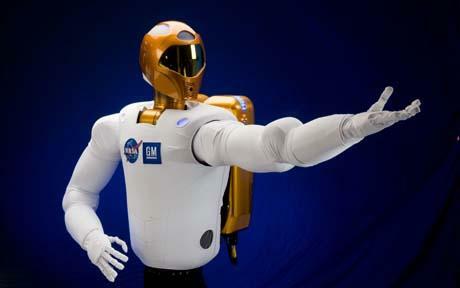 Despite the misleading number, Robonaut 2 is the first humanoid robot in outer space. When the mission is complete the Discovery is scheduled to go off to some museum. The entire shuttle program is winding down: the program was supposed to end in 2010 but international obligations compelled NASA to tack on a few missions in 2011. Endeavor is already on the pad for what may be its final flight and Atlantis is on standby. Enterprise (which never made it to space) is already at the Smithsonian. And, of course, Challenger and Columbia are both gone, lost along with their heroic crews in our first doddering steps into space. The shuttles seem so much a part of our culture that it is hard to recognize how revolutionary they were in the seventies and eighties (and still are). It’s true that they are shockingly dangerous but the technology used to create them pushed the limits of materials technology a long way. For example the thermal shields of the shuttle protect the orbiters from re-entry temperatures that could otherwise reach as high as 1,650 °C (about 3,000 °F), well above the melting point of steel. The program also advanced rocketry by leaps and bounds. The shuttles were the first spaceplanes to go into orbit. 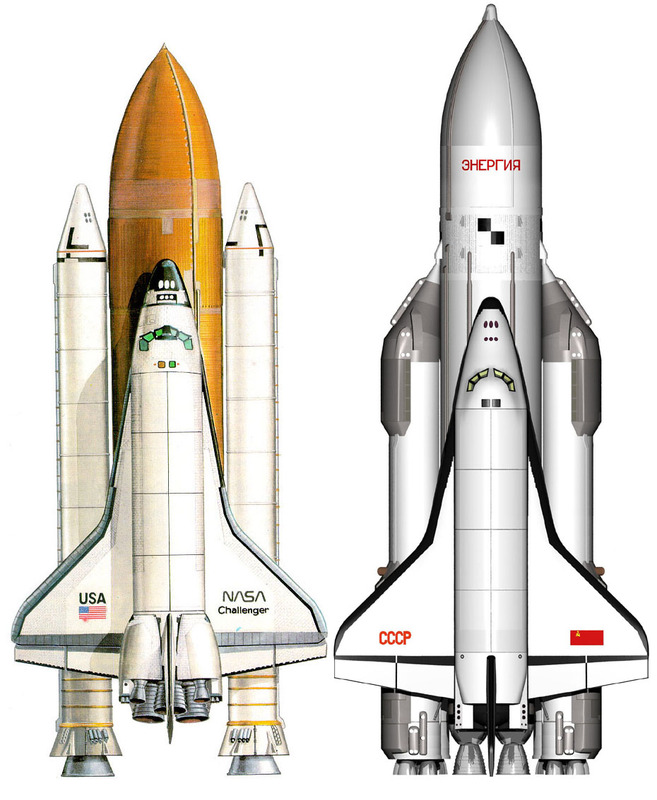 The only other spaceplanes that are known to have done so were the unmanned Soviet Bor-4 test craft, the Soviet Buran (a space-shuttel knock-off scrapped during the Soviet meltdown after one successful manned fligth), and the OTV-1 and OTV-2. Both of these latter vehicles are Boeing X-37B robot shuttles used by the United States Air Force to test (note to the Air Force and Boeing, please give your robot space planes cooler names). 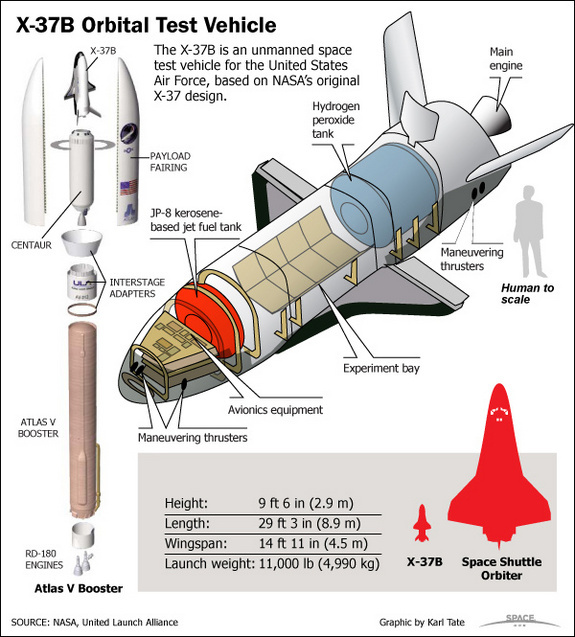 The X-37B is a automated shuttle with a payload about the size of a Ford Ranger pickup. Originally a NASA program which was scrapped for budget reasons the robot shuttle was picked up by DARPA and built by the Air Force which claims to use it to test guidance, navigation and control systems. Since the OTV-1’s mission (which was tracked by amateur astronomers) took the craft over Iraq, Iran, Afghanistan, North Korea, and China, it is reasonable to speculate that the craft may have reconnaissance purposes as well. There are a number of suborbital spaceplanes which have managed to reach above the Kármán line but were incapable of going into orbit. Lately private companies have been jockeying to make more of these space hoppers and conventional wisdom asserts that the market will step in and deliver the next generation of spaceplanes. Hopefully private innovators will come up with some bright ideas. Budget and technical constraints have lead NASA to scrap its plans for ramjet scramjet and spaceplanes. There isn’t much else on the drawing board that we know about right now (other than the Japanese Space Program’s origami airplanes which are seemingly designed to be tossed into space for fun pictured below) . The foreseeable future apparently belong to rockets. 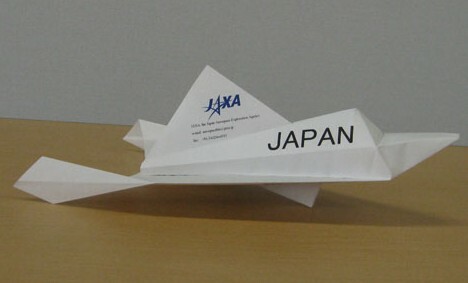 The Japanese Space Program's 29-gram origami shuttle made of treated ricepaper--the future of spaceplanes? Electromagnetic radiation exerts pressure on physical matter. The more the radiation is reflected from the surface it strikes, the greater the pressure–so sunlight presses harder on a mirror than on, say, an ostrich with the same surface area. I’m not going to dwell on the physics underlying this fact (although I will provide a link), but rather on the remarkable ramifications. Contingent on the amount of radiation, this force is rather weak. However, taken in aggregate, across a large surface, light (or any form of EM radiation) can move an object. Hence…solar sails! Much in the manner that wind pushes a sailboat through water, light can push an object through space. 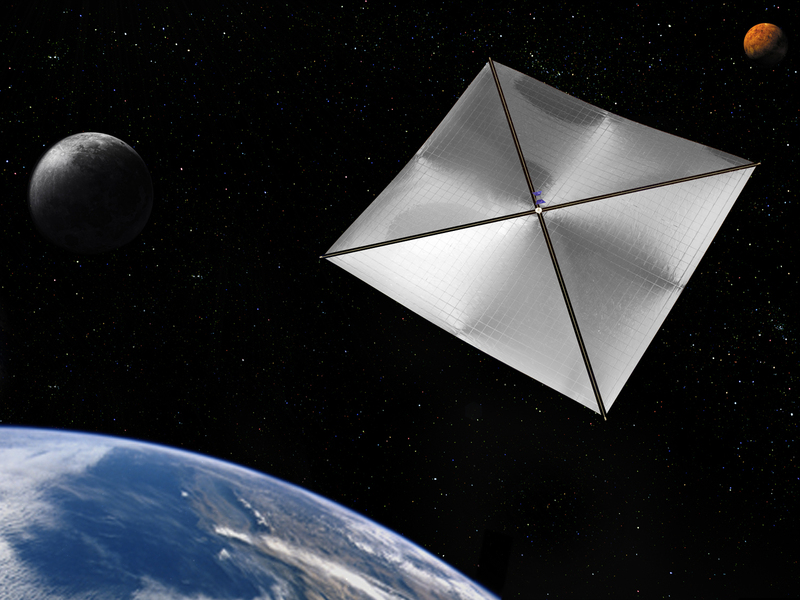 Although using such a sail for space travel was demonstrated to be feasible in the laboratory, the great national space programs—NASA, Russia, ESA, and China—have never successfully tested a solar sail in interplanetary space (despite several failed attempts). However, this year on May 21st the Japan Aerospace Exploration Agency (JAXA) successfully launched the IKAROS solar sail. IKAROS stands for “Interplanetary Kite-craft Accelerated by Radiation Of the Sun”–an acronym which somehow is both unwieldy and an allusion to a badly botched aerospace venture (JAXA can be forgiven for the awkward name however thanks to the success of the mission). IKAROS is a square sail with a diagonal diameter of 20 meters. It is made of polymer 7.5-micrometres thick. A solar array is embedded in the sail to supply the craft’s power needs. To provide attitude control, the sail also contains LCD panels with adjustable reflectivity. Various sensors, dust counters and controls are located on different parts of the craft. IKAROS deployed its sails when it was approximately 4.8 million miles from Earth (smoothly deploying a delicate lattice of sails in the grim void of outer space has been a major obstacle to this sort of mission in the past). The spacecraft is currently somewhere between Earth and Venus. When it reaches the cloud planet, it will embark on a three year trip around the sun. 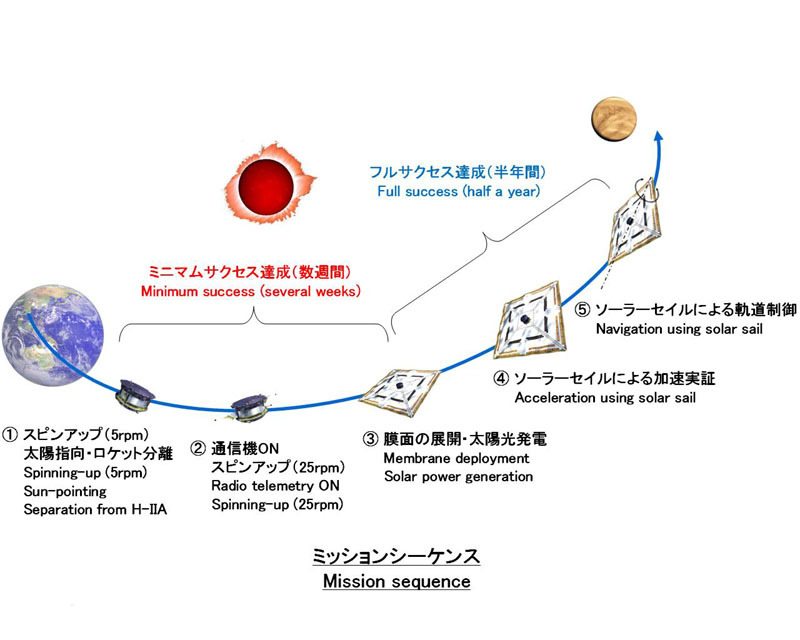 JAXA's next solar sail mission will apparently look like throwing a shuriken into an asteroid. Awesome! 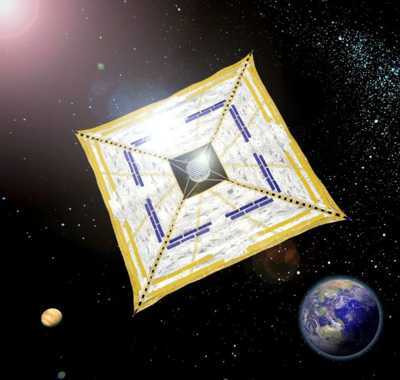 In the near future, solar sails might be used for interplanetary missions or for de-orbiting old satellites and space debris (this latter task is growing in importance as humankind fills up near earth orbit with junk). Hybrid drives which utilize solar sails and solar powered ion drives in tandem are also on the drawing board. In the farther future, who knows? So far this is the only possible option for interstellar travel which utilizes technology humankind currently possesses (well, aside from ridiculous nuclear fission designs). It has been proposed that giant space lasers could be used in tandem with the sun to accelerate probes to nearby stars. Unfortunately such lofty prospects are still science fiction at present.